What would it take to put an astronaut on Mars? Image caption When might we be able to send the first manned missions to Mars? A joint European and Russian space mission - the ExoMars Trace Gas Orbiter (TGO) - has left for Mars to study methane and other rare gases in the Red Planet's atmosphere, and drop a lander on its surface. The TGO is expected to take seven months to travel the 500 million km (310 million miles) to Mars, and then almost another year to manoeuvre itself into position, meaning the satellite's observations will not properly start until late 2017. What does this mean for plans to put an astronaut on Mars? In 2010 President Obama tasked the US space Agency Nasa with the goal of putting an astronaut in Martian orbit, and later on to the planet itself. But the challenges - technical, political and financial - are enormous. 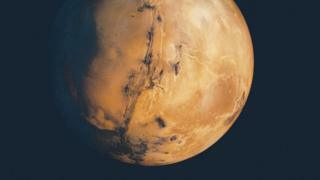 A recent report from the US Aerospace Safety Advisory Panel raised safety concerns about the proposed transportation spacecraft and criticised Nasa for a lack of detail in its overall Mars plans. Four experts - including two senior figures from Nasa - talk to the BBC Inquiry programme about what it would take to put an astronaut on Mars. Bill Hill is deputy associate administrator of the Exploration Systems Development division at Nasa. He oversees the Orion spacecraft and the Space Launch System. "Keeping the weight down of the vehicle, the spacecraft, that's our key focus. The bigger you make the rocket, the more mass you have to lift off the surface of the Earth. "Say you want to go for 500 days - you're going to have to take food, water for the crew to consume and use for hygiene, all the air, so it just multiplies the amount of weight that you have to lift off the Earth's surface. "That's where the Space Launch System - the heavy lift launch vehicle - will come in. Where the Saturn V basically took up an Apollo capsule and a lander for going to the lunar surface, we're looking at 130 metric tonne lift capability that can put somewhere between 40 to 50 metric tonnes out past the low Earth orbit. It's a capability that, frankly, nobody else has today. "The crew spacecraft Orion can actually be used for up to about 1,000 days, and that's how we're designing the systems inside - the environmental control systems and life support systems to support a crew of four initially for up to 1,000 days. It'll have basic benches, crew interfaces, flat screen monitors, a toilet and some hygiene capability. It's basically for transportation, not necessarily to live in for the full duration to go to Mars and back. "We would use a module, a habitat portion, for where the crew would live and work on a daily basis, [with] a much larger volume. That is going to need areas to store food, tanks to store oxygen and water. Our goal is to have some sort of closed loop system for life support where we will pull water out of the air, regenerate carbon dioxide into oxygen, and do similar things like we're doing on the space station today where we have a urine processor and reclaim the water for drinking. "We'll probably not use it to enter the Martian atmosphere because then we'd have to figure out a way to connect it to something to lift it off the surface and bring it back. But we need the heavy lift launch vehicle and the crew spacecraft; using those two fundamental cornerstones as our initial capabilities to actually go out and explore." Astronaut Samantha Cristoforetti has spent longer in space on a single mission than any other woman, returning to Earth last June after 200 days. Her experience - and that of Scott Kelly who has just returned after 340 days in space - is vital to understanding the potential impact of a lengthy voyage to Mars. "You lose muscle, because you're not using your muscles that much. But you also lose bone mass, because bone is actually a living tissue. All the time we have bone cells that die, and are replaced by new, fresh bone cells. In a healthy person, that is in balance, so that you always keep your overall bone mass. "But what happens in space is because you don't have that mechanical load on the bones, you destroy a lot more bone cells than you've actually built. What would it take to put a man on Mars? "We try to induce some load on our muscles and bones by working out for about two hours every day. Believe it or not, we can do weightlifting in weightlessness. We have a really cool machine which is based on vacuum cylinders, and it allows you to do things like squats, dead lifts and bench presses. "As soon as you get to space, fluids shift from the lower parts of your body towards the upper parts. Visually you can sometimes see it on astronauts, because they have what we call a puffy face and skinny legs, and that's really due to this fluid redistribution, because there is no gravity pulling the fluids towards the leg like it is on the ground when you're standing. "We don't know everything quite yet. Quite a number of astronauts actually lose a little bit of eyesight when they are in space for a long time, and that might be related to an increased pressure in the head due to that bodily shift. "In the Space Station we're still in an area close to Earth, which is protected from damaging radiation coming from outer space. Once you leave that protected environment, then you are much more exposed to dangerous radiations. So we will definitely have to come up with a good, solid plan on how to protect our crew on the way to the Moon or on the way to Mars. "We are not really very isolated on the Space Station - we're in continuous contact with the ground. You can basically communicate in real time. We get the news. We even get to have video conferences with our families, which is all wonderful, but only a fraction of that I think would be possible if you went on a journey to Mars." Jason Crusan is the director of the Advanced Exploration Systems division at Nasa. "What would they breathe? We would actually bring oxygen with us. Mars atmosphere has a lot of CO2 in its atmosphere so we can remove the oxygen out of it to create breathable air. Initially we'll bring a lot of the gases with us that we need to do that but over time we'll actually bring machinery with us to actually separate out from the atmosphere breathable oxygen. Media captionThe US space agency says it believes dark stripes on Mars are flows of water. "When we first started, we didn't believe there was any water on Mars. It's a bit of a joke now because we've discovered there's a significant amount of water on the planet, and we would look at the ability to capture water from the surface of Mars and process it and use it, much like you would here. "Food is a challenging area. We obviously fly all of our food into space today, we don't grow anything on orbit besides experiments. Food has a shelf life; bringing our own food reduces its nutritional value and we're talking about missions that are maybe a year to three years in duration. So we are looking at how we grow not our primary food sources, but food to augment the food that we bring with us. "Near the Equator you would see temperatures that are kind of similar to a spring day here on Earth, but then you'd have night temperatures that would actually be quite extreme, going to minus 100F. The temperatures are extremely challenging, and so you always have to live within a spacesuit or some kind of rover or habitat while you're there. "One of the best radiation shields is water, so that will be stored in key areas in order to provide shielding within the structures themselves. [We would] eventually have radiation sensors in orbit, monitoring for radiation events so that we can give a warning to the crew before a significant event so they can go into a sheltered area. "The large dust storms that you see in [films] would not have the effect that you see in Hollywood, because the atmosphere is relatively thin. Even what would look like a hurricane force doesn't have the force to do significant damage to your habitat, but there'll be challenges if you're outside in it because your ability to see from all the dust will be impaired. "I think logistics will be the biggest challenge. If something breaks, you're a long way from home to get a spare. Our entire experience in space to date has been an orbit around Earth or to the Moon, relatively close distances. In the space station today if something breaks you can send a replacement part. "When we go to Mars, we have to take everything that you'd ever expect to break, and even those things we wouldn't expect to break." Dr Jill Stuart is editor-in-chief of the Elsevier Journal of Space Policy. "There's the question of who has the money to do this, where will it come from, and what will their incentives be? "I like the narrative of [the Moon landings] being about science and the frontier of human kind, but in reality, I would argue politics was very much behind it. It's very expensive, so in order to go into outer space, to have a manned space programme, you need to have political clout, the backing of your population. "During the Cold War, the Soviet Union and the United States were competing with each other in the space race, and outer space was a proxy arena for them to compete in a way that didn't actually require military conflict. "I don't think the space race analogy would apply so clearly now - it's a different environment. "The US space programme is subject to political administrations; Americans like the idea of space exploration but there's not an obvious constituency for it in terms of voting, so it tends to get tacked on later on in an individual president's term, so it's difficult to say whether or not these plans for Mars will outlast multiple administrations. "But if it does then I think that they are the most likely to have the next manned mission, and would probably involve junior partners who are political allies in order to shore up those alliances, and also to have the financial support. "They would probably also partner with commercial entities such as Space-X or Blue Origin - new companies that are government-backed but private - and are providing a lot of the space infrastructure to get there. "There are discussions amongst politicians and scientists and the commercial industry so I think it's definitely the next big prize. I do think it will happen, but I think the timeline will probably be longer than is being talked about right now. I'm going to say 2045."